Just a few years ago, Felix Baumgartner broke the world record for the highest jump and longest freefall when he jumped out of a special space capsule attached to a helium-filled balloon at 128,100 feet. What fascinated me was what he said before he jumped. What Felix Baumgartner really experienced right before he jumped was a shift in perspective… a renewed focus on life. As we study Ecclesiastes 3 this Sunday, Solomon starts to bring life into focus. As his perspective begins to shift, so does his attitude about life and what’s important. 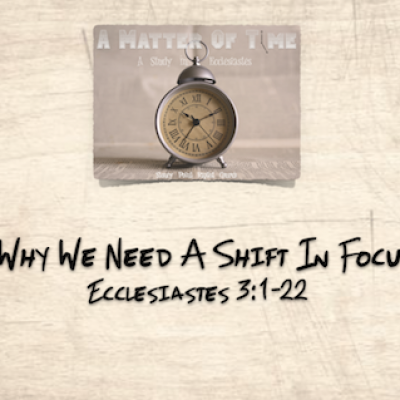 Join us tomorrow as we dive into Ecclesiastes 3, “Why We Need A Shift In Focus”.